PRICES ARE ACTUALIZED BY THE RUBLE COURSE AS OF 11/05/2015 (0.45 CPC). PRICES MAY CHANGE. REFINE AT THE BOOKING. 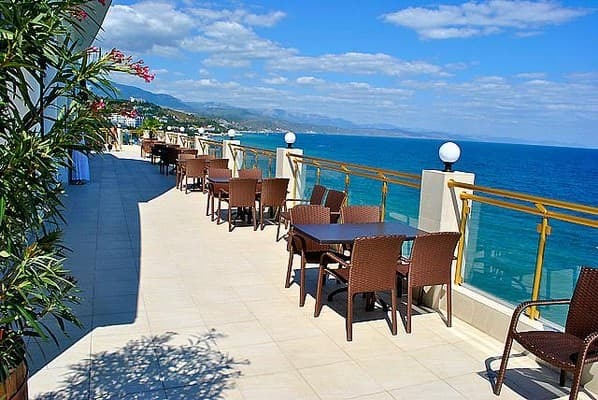 The Calypso Hotel is located in the picturesque Professors' Corner Alushta, on the beach, has access to its own beach. The air here is saturated with the smells of the sea, forest and mountain vegetation, which creates a unique climatic zone. 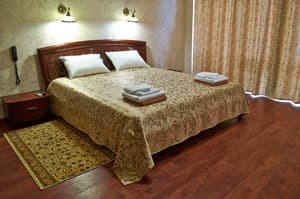 The hotel offers 30 comfortable spacious rooms. 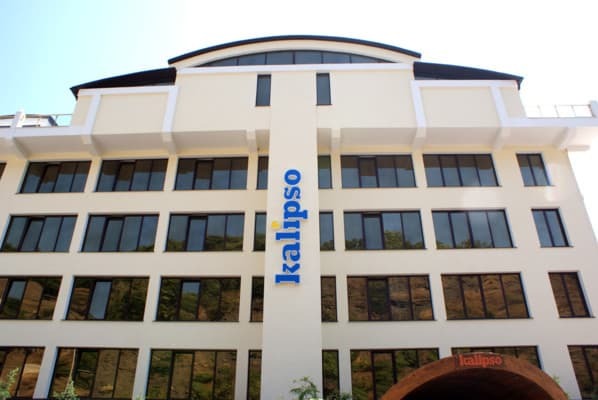 In each room of the hotel "Calypso" - a balcony, modern furniture and plumbing, air conditioning, safe, satellite TV, telephone, free Wi-Fi. The hotel guests are given the opportunity to use a variety of additional services: for fans to really relax and relax - visiting the Finnish sauna with a jacuzzi; for fans of outdoor activities - tennis, windsurfing, diving, cyclotourism, riding squares. Free private parking is available on site. The price includes breakfast. 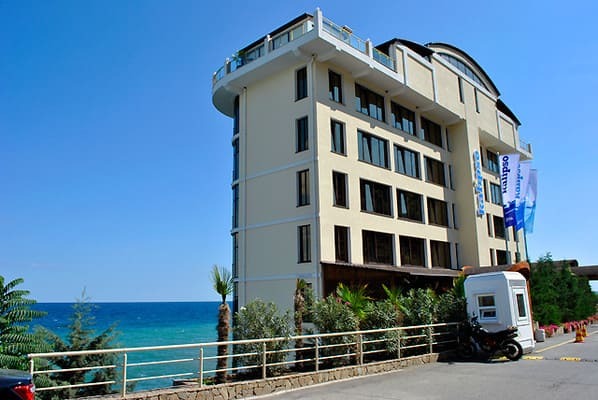 On the 6th floor of the hotel "Calypso" is a restaurant of European cuisine. The distance from the bus station is 4 km, from Simferopol - 45 km. Description of the room: One room with balcony, located on the first floor. 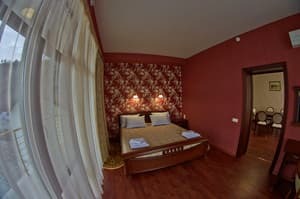 The room is equipped with two single beds, which can be transformed into a double bed if necessary. Description of the room: One room with balcony. The room has a double bed, on the balcony furniture for relaxation. Modern design, quality of furniture and textiles, panoramic windows, absolutely everything is aimed at a comfortable and full rest. 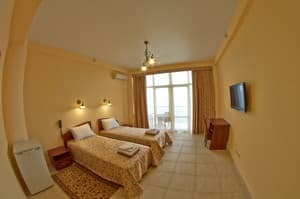 Description of the room: A spacious one-room suite with a bathroom and a balcony, in addition to a double bed, there is a large and comfortable sofa. If necessary, it can serve as an additional full bed, since it has the function of a "French clamshell." The architectural solution to replace part of the wall with panoramic windows allows you to expand the view directly from the room, which gives an additional feeling of light and space. 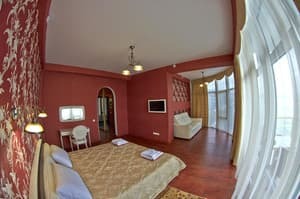 Description of the room: Comfortable and spacious two-room suite with a living room, bedroom and kitchen. The room has a large balcony-loggia, running along the room and allowing the exit of two rooms. The kitchen is equipped with modern built-in appliances and is equipped with the necessary set of dishes. Part of the interior of the living room is a large dining table, which allows guests to comfortably eat in the room. Children are admitted from the age of 12. The cost of extra bed is 300 UAH including breakfast. 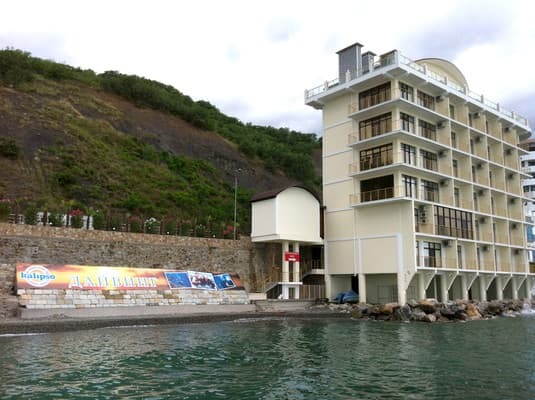 The hotel is located in Alushta (Professor's Corner) on the first coastline. The distance to the center of Alushta is 5 km, to the bus station - 4 km, to Simferopol - 45 km. From Simferopol to Alushta - a trolleybus № 51, № 52. From the bus station to the hotel - trolleybus number 2 (stop the sanatorium "Kiev", go to the embankment and turn right). Transfer order is possible.